Munstead Water Tower stands on top of a hill four miles south west of Guildford. Brick-built and 130ft high, it was erected in 1898 to supply water to the surrounding houses in Munstead and neighbouring villages and was in use for approximately 70 years. 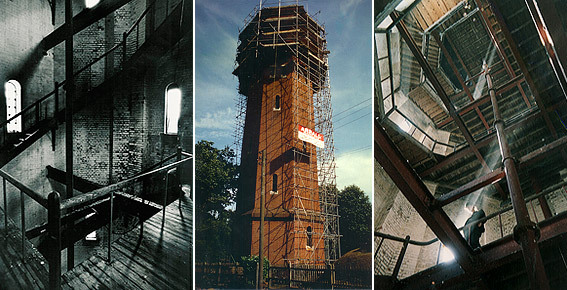 The Water Tower had been out of use for nearly twenty years by the time that it was bought at auction by me (Elspeth Beard) in 1989. The only residents were a large colony of squatting birds whose droppings were several feet deep in the base of the tower. 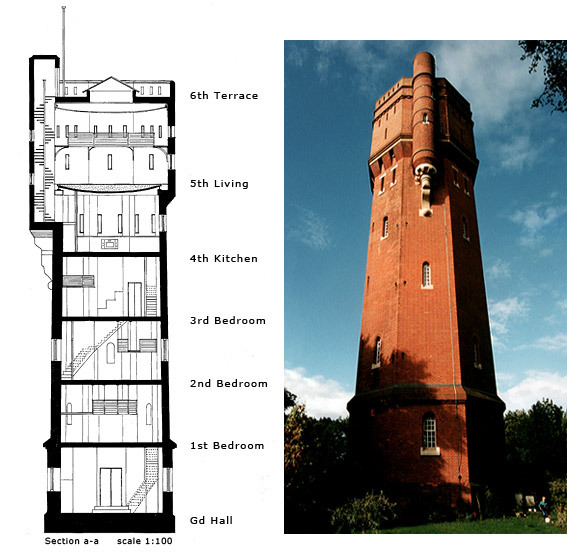 The tower consisted of six levels with a timber stair bolted to the inside of the external walls on three sides of the tower, with quarter landings at each level. On the fifth floor there was a steel-riveted tank 30ft in diameter. 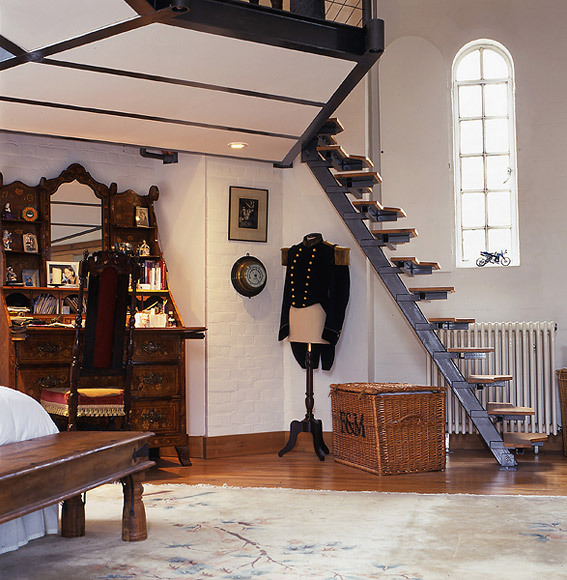 The 20ft high external turret on the North West side contains a Victorian spiral staircase which provided access around the tank and onto the roof. There were four cast iron pipes running from the ground to fifth floor level to supply the tank, which held approximately 40,000 gallons of water. Each floor consisted of two steel beams supported on pad stones made of York stone and the small areas of floor were constructed with timber joists and floorboards. All four floors were of a similar construction and only occupied about one third of the potential floor area at each level, leaving a central void over 80 feet high in the main central space. The external walls are of solid brick construction and taper up to fourth floor level; from there, the brickwork corbels out to support a York stone ring beam on which the water tank was supported. There are 64 windows; four on each of the ground, first, second, and third floors; 14 on the fourth floor and a total of thirty windows to the main tank room on the fifth floor. The original windows were cast iron with small opening lights to the top section of the window. I felt it was paramount for the design of the interior that I retained as much of the original building as was practically possible and in doing so maintain its industrial character. 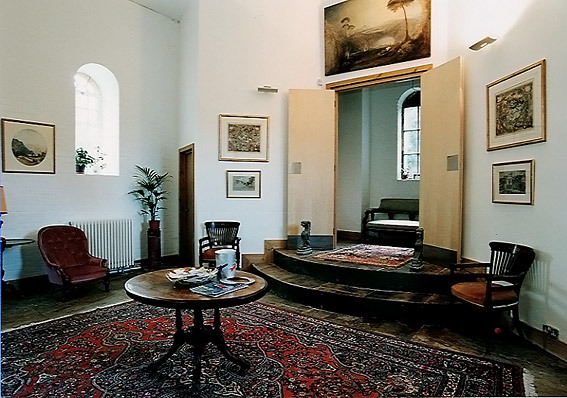 The refurbished and re-designed tower now consists of six floors with a reception room on the ground floor, and one bedroom on each of the first, second and third floors. 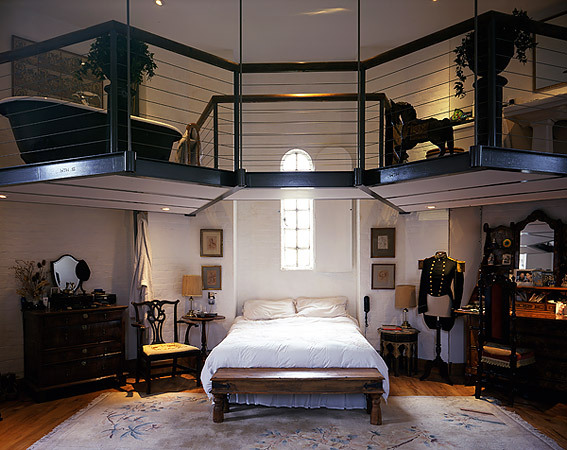 One large room occupies each floor, varying from 25-30 feet across with suspended hanging bathrooms in the bedroom levels and a gallery within the living room. 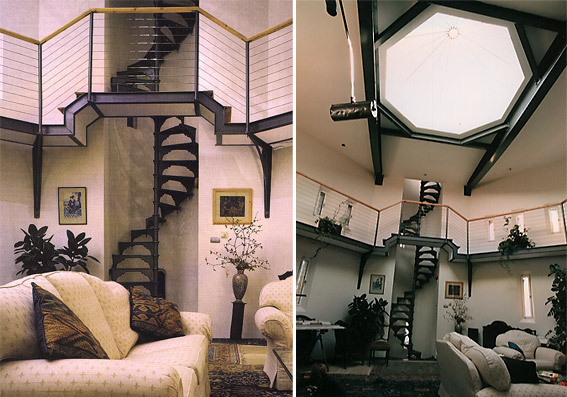 Internally, new steel stairs and floors were constructed using the original main floor levels. This involved fixing new steel beams at each level to support the new stairs and existing beams. There are now 88 steps to the kitchen, 116 to the living room and a total of 142 steps to the roof! 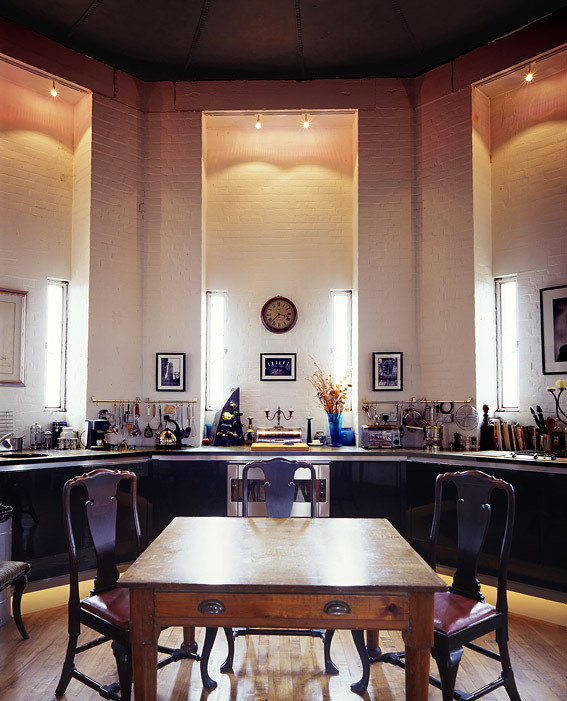 The kitchen is situated on the fourth floor and the living room lies above it in the space that was originally occupied by the water tank. The walls of the tank were removed but the base remains to provide a unique curved steel riveted ceiling to the kitchen on the fourth floor. The existing valve and float mechanism originally inside the tank was also kept and now stands within the living room. To overcome the problems with the 'Means of Escape' regulations the building is fitted with a fire alarm system linked to smoke detectors on each level and there are magnetic door holders fixed to the main doors of each room. 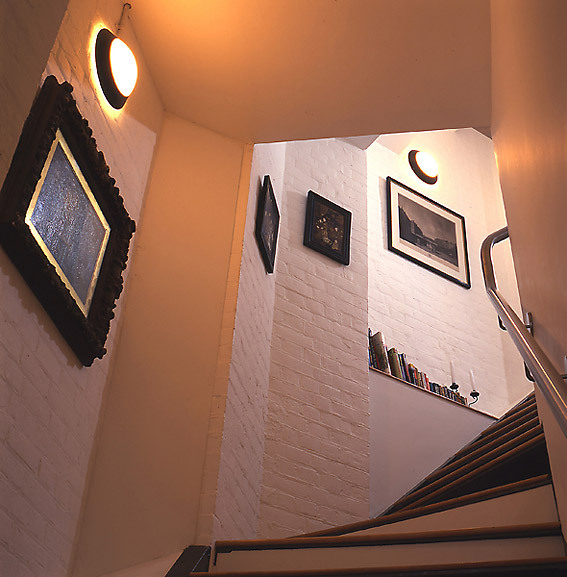 The stair provides a one hour fire-rated enclosure with separate emergency lighting. This huge project naturally divided into two parts. The first part involved basic repair work to the building fabric of the tower, to make it both safe and weatherproof; then followed the far more daunting task of turning it into a unique and desirable place in which to live. I played multiple roles; owner, architect and main contractor. I bought the building without planning or listed building consent which was a huge gamble. Planning approval and listed building consent was finally granted a year later after I had managed to win an appeal to the Department of the Environment (DoE). This allowed a crucial relaxation of the 'Means of Escape' requirements, which had previously been the main stumbling block. The building works took seven years to complete. The first task was to remove all the redundant pipe work and the steel tank and start the repair works to the brickwork and roof. The brickwork repairs alone took nine months. By the time the new steel windows were fitted and the roof completed, it had taken two and a half years to achieve a waterproof shell. 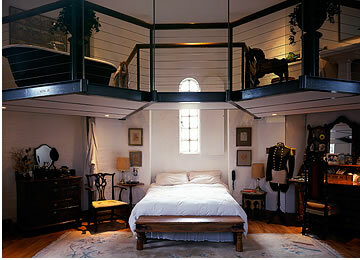 The existing timber stairs could not be re-used because they crossed many of the windows. The existing floor levels were retained but new steel beams were required on each floor to support the new stairs which also had to be made of steel since they provided the main means of escape from the building. Once the new steelwork was completed the timber floors were constructed, followed by the fixtures and fittings and final finishes. Allowing this beautiful old water tower to be converted into a residence has assured its future and provided an appropriate alternative use. The water tower is still my own home. After all the blood, sweat and toil involved in its restoration and conversion I was delighted to be awarded The Surrey Historic Buildings Trust Award in 1993, The Downland Design Award in 1994, The RIBA Regional Architectural Award in 1994 and only last year The Surrey Historic Buildings Trust 25th Anniversary Best Conservation Award. Click here to view published articles about the Munstead Water Tower project.